5 Reel Drive is a fun retro online video slot game from Microgaming that has been released in November 1999. This online video slot machine game has 5 reels and 9 pay lines. The theme of 5 Reel Drive is all about the fun, food and adventure you can get from a road trip. 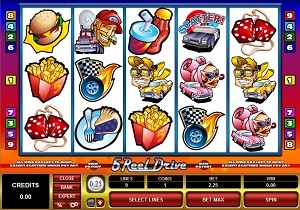 Since this particular slot game has truckers, police and greasy fast food symbols, you would think 5 Reel Drive only has a small wagering limit. What will surprise you is that 5 Reel Drive is actually a great online slot game created for everybody, even for the high rollers too! Microgaming online slot games are available to players in 2 formats – download and no-download. Whether you like to download their software first or you prefer to play instantly without the need to download, then Microgaming surely has slot games to cater to all of your slot gaming preferences. Since 5 Reel Drive is available for instant play, you can easily find out if you like this game enough to spend money in it. Are you ready for a spin around the country, meet some other drivers from all walks of life, avoid getting caught by the police when you’re speeding, get to eat scrumptious fastfood on the road, and get to win some real money? Then 5 Reel Drive is the one for you as this online slot game features scatter wins, a Wild substitute, a maximum jackpot win of 10,000 coins per line bet, and it has a 96.95% theoretical average return to player (RTP)! If you haven’t played this one yet, then you must have a go at it because the 5 Reel Drive slot game was quite successful enough to inspire a sequel – the Mega Moolah 5 Reel Drive online slot game! The quality of the graphics and sound provided by Microgaming software is definitely superb. They possess an impeccable track record of creating the most high-impact graphics and realistic sound effects. Most people love Microgaming because its online slot games have smooth animation and engaging yet non-intrusive sounds. In 5 Reel Drive, they have really done a great job of incorporating a video slot game together with a fun and comic-book type road trip theme. The symbols are drawn in a cartoonish manner, and even if they are brightly colored, you will still love to play for a long time as it does not strain your eyes. Most people even said that they felt quite hungry after seeing some of the food symbols presented in 5 Reel Drive! Some of the symbols have simple animated programming once you have formed winning combinations with them, such as the Wild symbol that repeatedly points the direction of the road you are going to encounter. The overall graphic design of 5 Reel Drive displays many different colors such as blue, green, red, yellow, pink, purple, brown, white, and orange. When you spin the reels, a ticking sound and then arcade game-type sound effects will be played. Once you get a winning combination, various and short music related to the theme will celebrate your wins; for instance, if you get a winning combination with a Wild symbol, you will hear the honking of a car. There are no card deck symbols available in the 5 Reel Drive online video slot game. The regular symbols that you will find in 5 Reel Drive are the Flaming Wheel, the Big Red (truck), Yellow Hotrod, Pink Hotrod, Dice, and foods such as the Cheeseburger, Fries, Soda, Blueberry Pie, and Coffee & Doughnuts. The Wild Symbol is the Winding Road Sign. The Winding Road Sign acts as a substitute for all other symbols (except for the Scatter symbol) in order to help you form a winning combination. The Winding Road Sign wild symbol can only be found on the 2nd, 3rd, and 4th reels. You are paid certain prize amounts (refer to the Payout table) when you manage to form a winning combination with multiple Winding Road Sign wild symbols on an enabled pay line. The Scatter Symbol is the Police Car. Scatter symbols mean that they do not need to appear in a line (on an enabled pay line) for you to win. The Police Car scatter symbol can be found scattered anywhere on the 5 reels, and you are able to form winning combinations as long as there are 3 or more Police Car scatter symbols that come out. Your winnings are calculated by multiplying the Police Car scatter symbol combination payout (refer to the Payout table) by the total number of coins you’ve bet. Please take note that if you get a scatter win and a regular, then you are paid out for both of these wins, because the Police Car scatter symbol is not required to come out on an enabled pay line for you to win. The scatter win is included to the pay line win. 5 Reel Drive has no Bonus Feature game available. 5 Reel Drive has 5 reels where you may bet on 9 pay lines. The minimum bet is 0.01 and the maximum bet is 10.00 per pay line. You can wager only 1 coin per pay line bet. Therefore, the maximum bet amount is 90.00 per spin. Please take note that the amounts mentioned are in Pounds, but they will remain the same if you choose to play in US dollars, Euros, or Canadian dollars. Also, for every coin that you wager, you will enable another pay line. You will be paid out for winning combinations on enabled pay lines only. The maximum payout in the standard 5 Reel Drive online video slot game is 10,000 coins per line bet. People who frequently play online casino games typically love to stay longer on online slot games that have an Autoplay function. Good thing that 5 Reel Drive is equipped with one! In Microgaming online slot games, they have 2 game modes – Regular mode and Expert mode. You can have the game spin automatically for you with the Autoplay function that can be found by clicking the Expert button (located at the lower left portion of the game screen). Spin Stop Settings – you can choose to Stop: when all spins are complete, when the highest payout is won, on any win, if credits won on a spin exceed or equal to an amount you specify, or if the total credits increase or decrease by an amount you specify. After putting in your preferences, just click on the Start button, and the game will automatically spin for you while you just sit back and enjoy playing this road trip-type, food and adventure-filled online video slot game!